"Many readers know by now that I share an important date with Padre Pio. September 23, the date of his death in 1968, is also the date that I was convicted and sent to prison in 1994 – seventeen years ago. I didn’t realize at the time that it was Padre Pio’s feast day. He wasn’t exactly on my mind as I was led in chains passed the TV cameras and jeering crowd to a prison-bound van. September 23 was the date upon which I last saw freedom, and for Padre Pio it was the date he last saw life on this Earth. I don’t want to just re-write “Saints Alive! 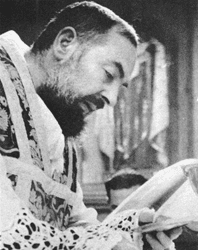 Padre Pio and the Stigmata” for this post. You can read it for yourselves, and I hope it reflects the immense spiritual respect and devotion I have come to have for Padre Pio. When I first came to this prison, he did not even enter into the sphere of what influenced me. I gave not a second thought to Padre Pio. I cannot really pinpoint when or how it happened, but he reached into these stone walls and gave me hope. It’s as though we share the deepest of friendships, but I could not begin to describe how and when we met.